Emily's Recipes and Reviews | UK Food Blog | Leicestershire : a taste of summer with mr. kipling + giveaway. Brighten up your Great British Summer with tasty treats from Mr. Kipling! Think a pretty pink twist to the beloved Bakewell, a trifle inspired iced slice and French Fancies with the flavours of Wimbledon. To celebrate their ‘Exceedingly Good Summer’ range, I've teamed up with Mr Kipling to feature a few of my faves as well as host an exciting giveaway. 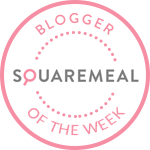 If you love Bakewell tarts as much as I do, this one's for you. So what's in the range this season? Think Bakewell Eton Mess, Strawberry Cheesecake Whirls, Trifle Slices and the return of the much loved Strawberries & Cream Fancies. My personal favourite was the whirls, which had the gorgeous buttery biscuit halves with a tasty strawberry fondant inner. I loved the Eton Mess inspired Bakewell too - such a fab idea! Although it doesn't quite beat the classic Cherry Bakewell for me! If you like Bakewells too, I did say you'd be in for a treat. Did somebody say 4ft inflatable Cherry Bakewell?! Forget flamingos and giant donut rings, imagine the look on other other holidaymakers when you cruise past on a giant almond delight. (Sadly, definitely not edible). 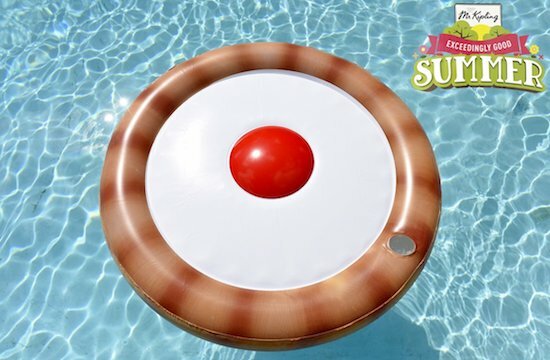 Try your luck below to win the inflatable Bakewell as well as a hamper of Mr Kipling goodies to nibble on! Simply answer the question and enter via the Rafflecopter, following on social media to gain more chances. Giveaway ends Monday 4th September - good luck! What is your favourite Mr Kipling treat from the Exceedingly Good Summer range? The strawberries and cream fancies look super yummy, so those. The trifle slice sounds amazing! The Bakewell Eton Mess. I'm dying to try them but can't find them anywhere. The Eton Mess Bakewell tarts are my favourite. the Strawberry and cream fancies sound delicious!